Rolling out a Drag and Drop email editor this year by email service provider Moosend, the new version of the Responsive Email Editor is aimed at marketers both experienced and beginners in designing email campaigns. The editor is open to try without registration, so you can see the Moosend Campaign Editor for yourself (link at the end of the article). Every editor in the market promises beautiful emails. The main thing the Moosend team said they were focussing on was to create them fast. That is where the free email template library helps. As soon as a user enters the Email Editor, a blank template awaits. From there they have two choices: one is to drag and drop a template from the Template Library and start customizing the font, texts, images, links, etc. The Template Library is a list of free newsletter templates per industry. They can be customized, to match the branding of your company, think changing fonts and colors, etc, etc. The other option is to start designing the email from scratch. Choose a style of containers and then start adding placeholders. Content types range from text, images, buttons, spacers, paddings, social media follow and share buttons. These can be added in templates, too. You can also use Personalization tags and emojis. If you have selected a specific container structure, by dragging in more elements (text box, images, etc.) the Editor will switch to the appropriate structure for the design. According to Moosend, one of the most popular new features is their email Countdown Timer. This feature builds in some perceived scarcity; to create a sense of urgency and improve conversions. You can choose from two types of countdowns (see below) Plain or Boxes (with customizable radius). Customize the colors, font styles, expiration date, and alt text! With the email countdown timer you can instigate action by sharing with your subscribers how much time they have left to claim a deal. You can fine-tune more design and branding elements, such as the font, the size and line height, color, alignment, and corner radius for buttons. Once a designed a section you are happy with you can templat-ize it with Saved Blocks. This way, you can make a “stamp” out of for instance your header, footer, returning structures or blocks, and save time when designing your email campaigns. 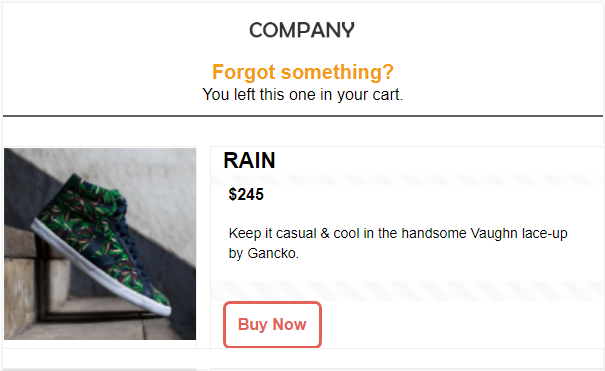 A cool feature for Cart Recovery or Product Recommendation newsletters. In them you can use Dynamic Content Blocks. Craft your newsletter like you normally would, but instead of adding a stock photo of a forgotten cart or a recommended product, you can bring in blocks which have Dynamically-loaded Content. This means that you can add the dynamic content block as a placeholder to your email design. First, you customize the information which appears. Choose from a list of elements such as product code, product price, product URL, product category, image, etc. Your signed-in users who abandon their carts will receive an email with up to 10 abandoned items from their carts. To use the abandonned cart feature a marketer must set up website tracking and integrate the ecommerce platform with the Moosend account. See here an overview of the integrations with major ecommerce platforms. To keep the newsletter design you have just completed, Moosend Editor gives you the option to save it as a template and use it for future emails. It will be saved in the Template Library, and you will be able to use it multiple times changing the text, customize it etc just like you would a normal template. It is a responsive drag and drop email editor. With this email editor it really means drag-and-drop, so you don’t need to know any html or coding. But for those more into HTML email, there is an email HTML. Click “Split View” to split your screen and see what your imported HTML code looks like and you can also edit it there or add blocks of HTML from the Drag and Drop editor. While designing, it is handy to save your progress, you can save Save drafts and Save Templates, but if you forget to save, the Editor will auto-save versions of your newsletter design along the way, so that you can get back to it, if you made a mistake. Email designs in the Moosend’s Editor are responsive. Templates are made to adapt and be shown correctly across all devices, but you want to see how they look like. By clicking “Preview” you’ll see what your newsletter, also in mobile without leaving the platform. Sending tests is a fast way to send your team and yourself the email newsletter you have designed. It will appear exactly as it would to your subscribers. You won’t have to exit the Editor to send test emails, and you can resume editing immediately. You can send it to unlimited people, and certain personalization features appear (depending). Standart it doesn’t appear as [test] or anything else so that deliverability is not affected. According to Moosend, the original idea was to redesign their Campaign Editor in a way that those who use it for the first time, those who have just switched to Moosend, and those who are not high-frequency users can still use the platform without having to learn to to do so. All features are available to all Moosend users, regardless of their subscription plan, so that includes free / trail users. Everyone can have a look in the editor and use it with their free 3-month trial that has unlimited sends and campaigns up to 5K unique subscribers.